Imagine browsing through Tinder one day, trying to find a friend or someone to hook-up with, and suddenly you come across...a golden retriever. What would you do? Tinder, for those not in-the-know, is a dating app where people can view profiles of folks in their area. If you like someone, you can swipe right, and if you don't, you swipe left. If two people like each other's profiles, then they can start chatting with one another. It's become a pretty popular app. And just like people like setting up joke OKCupid accounts,some people set up joke Tinder accounts. In this case, Joe Veix decided to join Tinder as a 26-year-old dog named "Hero." Hero was initially a male dog interested in both men and women within a 100-mile radius. Hero isn't picky, either: he swiped right on every single person he came across. Some people liked Hero back—because, c'mon, he's a freakin' golden retriever. It didn't even matter that Hero didn't list any interests. The way people reacted to Hero was kind of amazing—fair warning, there's some NSFW language in the rest of the post. But here's where it gets interesting: at one point, Veix changed Hero's gender, so that Hero was a female dog looking for both men and women. Hero started getting a ton of responses. "There were too many matches to keep up. It became difficult to swipe right at a steady pace, because the 'It's a Match!' screen animation would play after every profile and slow me down," Veix wrote on a blog post. Interestingly, many of the responses were "immediately sexual," which is a stark contrast to the few interactions that got sexual when Hero was a male dog. Not entirely surprising, especially given that this specific guy apparently likes "busting fake profiles," but still. Cripes! Eventually Veix deleted the app. "I got sick of my phone being overloaded with Tinder notifications and awful messages. 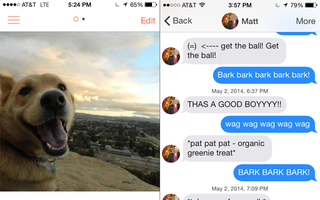 Even if you're a dog, online dating is terrible," he concluded. You can see more details about Veix's adventures as Hero, as well as more pictures of his interactions with strangers, here.